No one wants to be known as a waffler, but in the kitchen, everyone loves them. They make one of the best breakfast foods known to mankind. Hot and crispy on the outside and fluffy on the inside, we love to cover this sweet confection with fruit and syrup and other tasty goodies. But the base, the foundation of this lovely little food must be hot and fresh and perfectly made. That’s an easy thing to do today with all the waffle makers in the market. But, some are better than others, so let’s take a look at the best belgian waffle makers in the market at the moment and compare them. 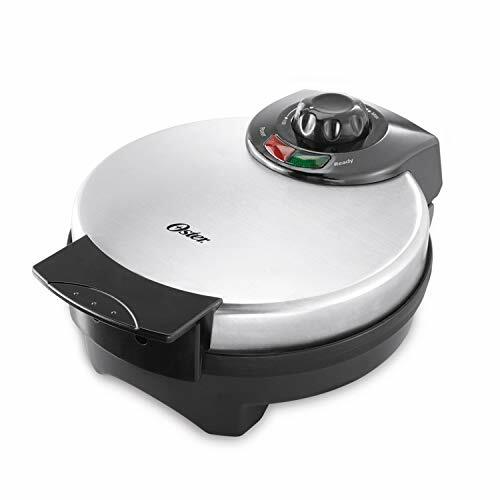 Oster, a much-respected company in the food preparation appliance industry has several waffle makers on the market. 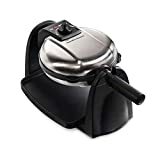 This particular Oster waffle maker has all the standard features and is at the right price point for anyone wishing to even try to make waffles. One of the lower-cost waffle makers, it nevertheless boasts all the usual features needed to make great tasting waffles. The features on this waffle maker are pretty much the standard so you won’t have to sacrifice features or service for the lower price. The round, nonstick grids produce a roughly 8” x ½” deep round waffle that easily breaks apart into 2 halves or 4 quarters. The pockets are deep to allow for an ample amount of toppings. 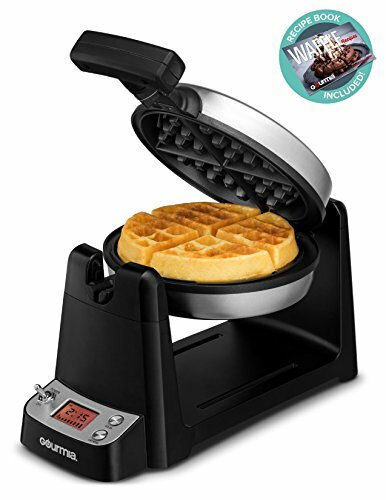 Because the coating is nonstick, the waffles release easily with no mess.The temperature control is a dial that allows for a good variety of settings from just lightly browned to very brown and crispy. Because it is a dial, you can incrementally find the exact setting that will produce the perfect waffle for you. 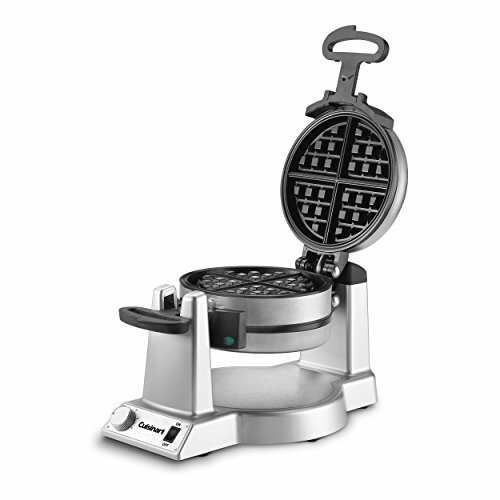 In all cases, the outside of the waffle will crisp to the degree you wish while interior remains fluffy.The waffle maker features cool-touch handles so you don’t have to use a hot pad or other protection when closing or lifting the lid.Operation of this waffle maker is easy, as are most on the market these days. Cleaning the waffle maker is a breeze too. You just need to wipe it out with a soft, damp cloth. It measures only 10 x 4 x 8 so it is compact and won’t take up lots of counter space or cabinet space while in storage.When you plug it in, the red indicator light comes on. When it’s ready to cook, the green indicator light comes on. You can read full review of the Oster Belgian waffle maker here. Presto, another well-respected food preparation appliance manufacturer has been producing small kitchen appliances for years. Known for quality and value of their products, this one stands out for simplicity as well. Designed for ease of use and nonstick cleanup, this waffle maker nevertheless boasts professional styling and a restaurant-grade design. The extra-thick grids have deep pockets for lots of great toppings. 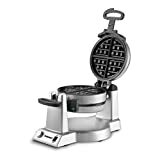 The nonstick grids produce a waffle measuring about 7 inches in diameter and about 1-inch thick with four quarters that make the waffle easy to cut or tear according to each person’s appetite.Very professional looking, the base permits the waffle maker to flip upside down to assure even distribution of the batter.A timer in the base lets you set the desired cooking time, usually between 3 and 4 minutes. When the waffle still needs a minute to bake, the timer will beep to let you know. From then, the indicator screen will count down the seconds until the waffle is done. At that point, it will beep several times.All in all, this waffle maker is very easy to use and just as easy in the cleanup. The flip feature allows for easy storage that takes up very little room on the countertop or in a cabinet. You can read full review of the Presto Ceramic Flipside Belgian waffle maker here. If you like a good waffle, you will appreciate what Cuisinart has done in the design of this little appliance. A compact, attractive, durable, and restaurant-grade waffle maker that’s easy to use, even the connoisseur will like this machine. Easy and simple, this product compares very favorably with other waffle makers on the market, but is far more expensive than others. Part of the reason for the disparity in cost is that this one makes two, deep waffles, at a time. However, if you have a large family, that will greatly work to your advantage.Included with this waffle maker is a user manual in both English and Spanish, and a measuring cup for the batter.The browning control has six settings that ensure that each waffle is made to order. And the waffles bake quickly, in about 4 minutes. The nonstick coating allows you to remove baked waffles easily and without worries about cleanup.Unlike most, this waffle maker has 1400 watts of power, so you know it can get the job done. 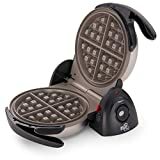 Though made for home use, this waffle maker is definitely of professional quality, and plugs into any 120V outlet.The waffle maker sits in a cradle that enables the appliance to rotate 180° and it is this feature that allows you to make two waffles at a time and they take about 4 minutes to bake. You can read the full review of the Cuisinart Double Belgian Waffle Maker here. checkTemperature control has six settings. If you simply must have removable plates in addition to the flip feature, this waffle maker could work for you. Hamilton Beach, another well-known manufacturer of small appliances offers this little appliance for your consideration. Like some waffle makers we’ve already looked at, this one flips on its axis 180° to make sure batter is evenly distributed on its nonstick grids.The appliance has an indicator light that lets you know when the power is on and when it’s ready to start baking delicious waffles. You control temperature with an intuitive dial that allows for small incremental adjustments in heat.The grids and drip tray are nonstick so clean up is easy with a soft cloth. However, they are removable and dishwasher safe, so if some stubborn baked batter remains after your waffle-making, you can simply remove them and put them in the dishwasher. They are dishwasher safe.The cool-touch handle allows you to open and close the lid without fear of burning yourself and it folds away for storage. FLIPPING ACTION MAKES THICK, FLUFFY WAFFLES. Flipping waffles during cooking makes them crispy on the outside, fluffy on the inside. NONSTICK REMOVABLE PLATES. Remove your waffle from the nonstick plates with no sticking or scraping; the grids remove when you're done cooking for easy cleanup. ADJUSTABLE BROWNING CONTROL. Cook your waffle lighter or darker, just the way you want it. STAINLESS STEEL DESIGN. Waffle iron wipes down easily and has a modern look that will look great on your countertop. EASY-CLEAN GRIDS AND DRIP TRAY. The grids and drip tray are removable and dishwasher-safe for simple cleanup. Gourmia has produced a totally digital waffle maker that enables you to control time and temperature with the touch of a button. And you can see how much time is left until you sink your teeth into that delicious waffle on the LCD display. We have here another waffle maker that rotates 180°. This flip feature is a growing trend among waffle makers because it helps to more evenly distribute batter for evenly cooked waffles.The digital controls make everything easy, so you can bake perfect waffles every time. Make them light, darker, or darkest according to individual preferences.In addition to the step by step user manual, the manufacturer has included a waffle cookbook that gives recipes to get you started and keep you going with some extra ideas. All in all, I like the Hamilton Beach Flip Belgian Waffle Maker with Removable Plates. It has the flip feature which I like so much, as well as the dial for incremental adjustments, as well as dishwasher safe removable plates. Your final verdict got me excited. I took time to read through and all seem good. I was wondering which to go with until I read through your verdict. I think I will consider going for the Hamilton Beach Flip Belgian Waffle Maker, I like the removable plate feature. Thanks for the detailed review. It is my pleasure the review was useful to you. Hey Chris Ender, you’re really doing a great job here. I stumbled to your site while looking for the best belgian waffle maker to buy. After some considerations, I think I will be going with the Gourmia waffle maker. I like its fancy features. Feels good reading through. I love waffle a lot but I never considered trying to make it myself until recently. I had many recommendations on the best waffle maker but this review actually got me convinced. I finally went for Presto 03510 Ceramic FlipSide Belgian Waffle Maker. It’s so nice. I got a waffle maker last year but I don’t really like it. I’m considering getting a better one. Can you recommend any one in particular? Thanks. Hi Lucas, our top pick is the Hamilton Beach Flip Belgian Waffle Maker. It is reasonably affordable and also has great features. Indeed. Best option for someone who is on budget. You can read our in-depth review of the waffle maker here. Thanks for the post. It’s the best waffle makers review for me.